For a long time in the mid to late twentieth century “Vietnam” was a word with a somewhat negative connotation in the West. Today it conjures up a land full of hope, with areas of great natural beauty, a hardworking people determined to build an advanced country equal to any on earth, and an ancient culture carefully preserved and kept vividly alive. In Vietnam, you will find a people full of contrasts, as you might expect from a country going through a period of rapid and far-reaching change. In the cities, everyone seems to be in a frenetic hurry to get where they are going; in many parts of the countryside, on the other hand, the pace of life and the traditional attitudes reflect an earlier era where patience and stoicism were the abiding virtues. Together, these qualities create a delightful kaleidoscope of cultural difference that will reward the thoughtful and inquiring visitor. Culture Smart! 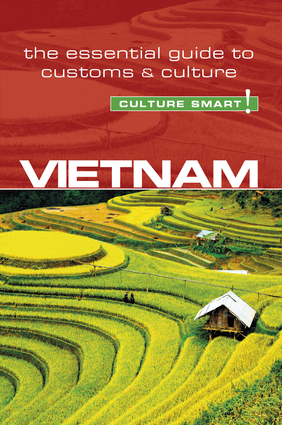 Vietnam is for those who would like to learn a little more about the culture, traditions, sensibilities, and modern way of life of the Vietnamese. It explains deep-seated attitudes and describes some of the social, economic, and cultural changes now under way. Aimed at dispelling common misconceptions, it gives practical advice on what to expect and how to behave in unfamiliar situations. Gifts for brides and grooms are usually given in pairs. A single item indicates that the marriage is not expected to last long. Two cheaper items will be accepted with more pleasure than one expensive one.